Finally we have a chance to stay at Oxbow Campground in Hillsborough NH which was my absolutely favorite from our two-day trek visiting all the local campsites. Also to add some excitement we were going to try backing into a campsite. Thus far it’s been all pull through’s, which has been great in most cases, but in this campground we wanted a site up in the corner and we needed to back in. One good thing, is because the site is on a corner Lee was able to pull straight up the road and then back straight in. This made things much less stressful. Plus we had our handy walkie-talkies and wow, was that helpful. The alternative would be us yelling back and forth to each other, I am sure to the amusement of the neighbors which is really not my style and frankly could devolve into something less pleasant quickly. By using the walkie-talkies we could talk in a calm voice which I think helped considerably. First we both got out of the truck and walked the site and agreed upon where we wanted to be. This was important because we both got a say on exactly where we would be, the main conversation being around the length of power and sewer hose and how close we wanted to be towards the fire pit. Fantastic fire pit by the way, surrounded on three sides by stone, really nice. Anyway, after we decided it was simply a matter of me directing him to that spot. It went pretty well, but once we were in we noticed that the camper wasn’t level. Before unhitching, we went into the camper and there was a definite lean. Lee tried to use a level to see how bad it was and in what direction, but didn’t find it that helpful and instead put his tube of ChapStick on the table and it rolled right off. I definitely felt like I was falling over and after some discussion we decided we didn’t want to feel like that all weekend. We had to move it twice more each time getting closer to the center of the site and farther away from the fire. Unfortunately the fire pit ended up being behind us (although that worked out fine in the end) and we lost a lot of room on the lot. The good thing was because we were on a corner our view was great, so it didn’t matter so much we were in the middle of the site. Lee says the solution is leveling blocks which we don’t own. Kind of surprised we haven’t run into this until now but I suppose sticking to pull through sites has made it a non issue. It worked out ok in the end but definitely a lesson learned. The campground was really great, everything I remembered. The owner is very nice and very attentive. We saw his presence several times. He even helped our neighbor get his slide out to deploy when he was having issues. It’s a large spacious campground and immaculately groomed. Grass was cut, campsites free of debris and obviously well cared for. Bathrooms were clean and numerous and my favorite part was that it had a little pockets of camping for different styles. There was a nice meadow (wooded on the edges) for those that like that type of camping. another meadow had a fantastic view of the valley. Several pull-throughs close to each with additional parking for guests, the area in the back that was wooded and less campers, pond views, wood views, and even a set of sites by a stream. The campground has a catch and release fishpond, a swimming pond, and a small boat pond with free paddle boats and a canoe. 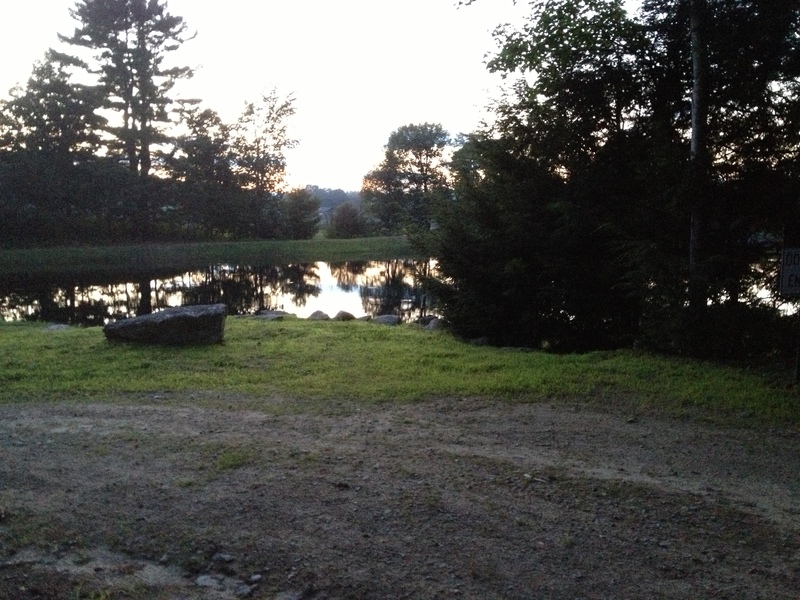 Seriously, aside from a lake or an ocean, this campground has a little bit of everything. There is also a nice sense of community with seasonals interspersed through the weekender population. We saw several volunteers on golf carts and they provide trash bags and pick up your trash at your site every day before 3pm. There was a lively game of horseshoes that weekend, several groups sitting together at campfires, and several kids of different ages using the playground and swimming areas, but the well-behaved kind 🙂 Lee even got to see a chipmunk which came onto our site in the early morning Saturday and jumped on a log and then scolded him. Lee’s very fond of the chipmunks. My favorite thing was a small petting farm with a horse, donkey, and several chickens. What a great idea and the kids loved it, wandering up to see the animals. The only down side was no wireless except at the main house and a very small and nearly empty store. Camper’s World is only an hour away and a full grocery store and McDonald’s is within minutes in Hillsborough (which is a very nice New England small town) but I was surprised they didn’t offer more. They do have a large rec center with some very old arcade games… Lee and I played a race car game that we had played when we were kids together, an air hockey table, pool table, and a big screen TV. Despite the wireless issue (we used 4G successfully all weekend) I have to give the campground highest marks definitely 5 pine cones!! This entry was posted in Uncategorized and tagged Back In campsite, camping, chipmunks, Hillsborough, leveling blocks, New Hampshire camping, newbie campers, Oxbow Campground, walkie talkie. Bookmark the permalink. I was pretty pleased to discover this great site. I wanted to thank you for your time for this particularly wonderful read!! The Walkie Talkies are a grand idea. I have heard so many campers who arrive late at night where the husband and wife share loud stressful words while the whole campground listens. It is almost comical to hear but I am sure the people trying to get their rig parked are not having fun:) Thanks for sharing your experiences.